Marketing is an on-going process — not the completion of a task or series of tasks. 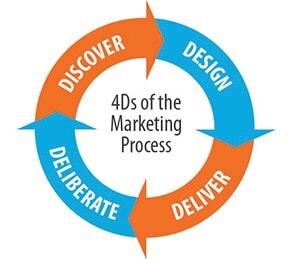 To illustrate this process, Veritas Marketing has developed the 4Ds. Research the market, target audience and competition. Anticipate trends before they happen. messages and tactics to achieve them. Execute the elements of the plan in a cohesive way. Continuity, clarity and focus are key. to PROBE for the next PLOT.